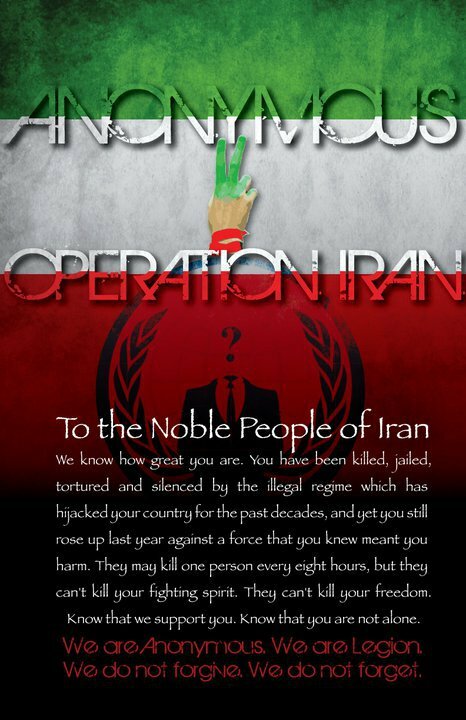 OpIran Press Release - Anonymous to The Noble People of Iran ! OpIran Press Release -Anonymous to The Noble People of Iran ! We know how great you are. You have been killed, jailed, tortured and silenced by the illegal regime which has hijacked your country for the past decades, and yet you still rose up last year against a force that you knew meant you harm. They may kill one person every eight hours, but they can't kill your fighting spirit. They can't kill your freedom. Know that we support you. Know that you are not alone. YOU are Legion, and we expect you. The protesters who are imprisoned and beaten; the bloggers who are censored; the citizens who are executed for speaking against the regime: you are the ones truly loyal to your country. To those that would remain intimidated into subdued silence: You have passively enabled your government to make a mockery of your freedom. Now is your chance for action, for redemption, and representation. A new dawn is approaching, that will set you and your great country free from the shackles of oppression, tyranny and torture. It will let you exhale, and finally take the first breath that will fill your lungs with strength, wisdom and freedom. Anonymous; You, Me, Everybody, and Nobody. Together we can nullify any threat to our human rights, and they know it. They are aware of our existence, and the coming cascade, but know that they are powerless. As we have been forced to fear them, now they will learn to fear the Power of the People. Most of all, they fear you; Which is why they have kept you in shackles for so long. This is your time, you can now seize it and pave the way for your own future. The government of Iran deliberately portrays dissent as disloyalty, unjustly making "examples" out of those who speak against sanctioned actions. This strategy only works if people are intimidated into inaction. The government needs to be held accountable for its crimes against you, its citizens. You were the victim, but now you are the judge. Make your ruling. People of Iran, you will not be denied your right to free speech and free press; your right to freedom of assembly, uncensored information and unlimited access to the Internet; your right to a life without oppression and fear.